This week was filled with meetings and traveling. So, unfortunately, we only got 3 days to work in our area this week. But we were spiritually fed for sure! To kick off the week, we headed up to good 'ol Lakeville once again for some exchanges with the zone leaders. It was great! I keep ending up going back there one way or another and it always brings back good memories. One story from that day: We talked to this African American guy named Melvin in the parking lot who was actually tinting his windows. He said, “Yeah you guys can talk to me while I work on my car!” He said he was 21. We got to know his background a little more and he had grown up going to many different Christian churches, but recognized that a lot of pastors are focused on money and there is a lot of corruption in many churches today. We told him how we have an unpaid ministry in our church and that we actually have to pay to be out here on missions. He was like, "No way man, that's dope! "😂 We taught him about what the Book of Mormon is and how we use it hand and hand with the Bible. We explained that it helps clarify doctrine that is easy to be misinterpreted through many translations of the Bible. We ended up sharing the example of God the Father and Jesus Christ being two separate beings. And he says, "Well yeah when Jesus is praying on the cross he says Father why have you forsaken me, I mean that's clear as day man!". Haha. We both just smiled and were like, "Amen to that!😂" It actually took me off guard because you don't meet too many people here who ponder seriously about the nature of God and Jesus Christ! It was a pleasant surprise lol. He said he would read the Book of Mormon, and we set an appointment with him! It's always a joy to find people who are open and seeking for truth. The next day we drove to the cities and had new missionary training all day. Elder Nielson is a stud! We are like long lost brothers lol. We had some great training sessions. It's always good to review the basics(: Saturday was also filled with district meeting and interviews in Mankato, which is about an hour away. Interviews are always so uplifting! We received a lot of good training on utilizing Facebook in our missionary efforts, and it's still hard to get used to using it again but it's been great for contacting people and organizing events and what not! Despite a lack of time in our own area, we've had some really great lessons! 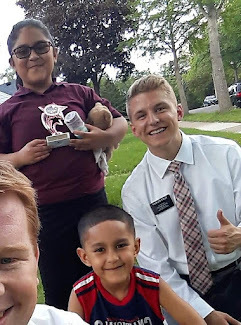 We started teaching a less active Hispanic lady in the ward and helping her and her two boys coming to church more regularly. We also taught a super energetic kid named Landon who's mom is less active, but she has agreed to have us help teach and help him be baptized! We had a great lesson with him on Wednesday and set a date for him to be baptized in 3 weeks! I hope you are all super stoked for General Conference! I sure am! I hope we take this amazing opportunity to hear from modern day apostles and prophets with sincerity of heart. I encourage you to write down questions or an aspect of your life that you are struggling with, and promise you that as you listen to their messages you will receive personal revelation and guidance! I know that God leads us with a prophet today. What a blessing it is to hear his words! Thanks for all your love and support, have a wonderful week! !